Olive Garden Fried Mozzarella is a favorite of so many people. 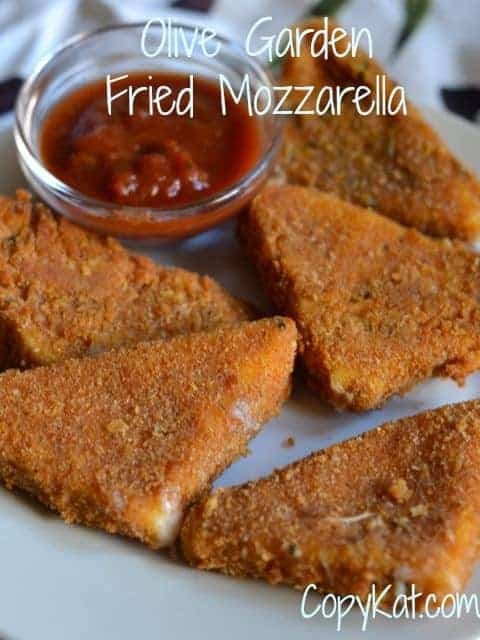 You can’t go wrong with this fried mozzarella recipe. You might think it is hard to make Olive Garden Fried Mozzarella, but it is very easy to prepare. You can learn how to make fried mozzarella in no time at all. You may want to chill the cheese before battering to help ensure it doesn’t melt in during the frying. You can also fry cheeses like Paneer, Queso Blanco, or Hallumoini as they have high melting points. Ensuring the cheese is well-battered is helpful so the cheese does not ooze out of the coating. Do not fry too many pieces at once as the oil temperature may drop too much. You should fry a few pieces at a time. Enjoy the ooey, gooey and cheesy mozzarella sticks at home with this copycat recipe. No need to fight over the last one when you can make them yourself at home. Love cheesy appetizers? Be sure to try these cheesy appetizers. If your cheese is in a brick, slice it thick and cut the cheese crossways to make triangles. Beat the eggs with water and set aside. Mix the bread crumbs, garlic salt, and Italian seasonings and set aside. Blend the flour with cornstarch and set aside. Heat vegetable oil for deep frying to 360 degrees. Dip cheese in flour and cornstarch blend, then in egg wash and coat with breadcrumbs. Place carefully in hot oil and fry until golden; this takes just a few seconds so watch carefully. When golden, remove from hot oil and drain. Serve with your favorite Italian spaghetti sauce and enjoy. These are amazing! I have made them several times. With a lot of recipes I add a pinch of this or that, but these are perfect just as the recipe is stated. Thank you! Making an Italian feast for mom in laws birthday. This will be perfect with it! I hope you feast went well. After coating, I will.place in freezer for a couple of hours. Allows them stay in the oil longer without falling apart. My kids will love this recipe! Looks so good! I tried this recipe and they are so good! Loved it and will make them again! I am so happy you enjoyed this recipe. I love Fried Mozzarella I thought I would never be able to make it at home! This recipe looks so easy I’m going to try it! It isn’t too hard to make this at home!